From The Tempest by William Shakespeare. Shakespeare may have associated his ‘brave new world’ with ‘beauteous mankind’, but Aldous Huxley’s novel of that name (1) presents a very different view of human society. 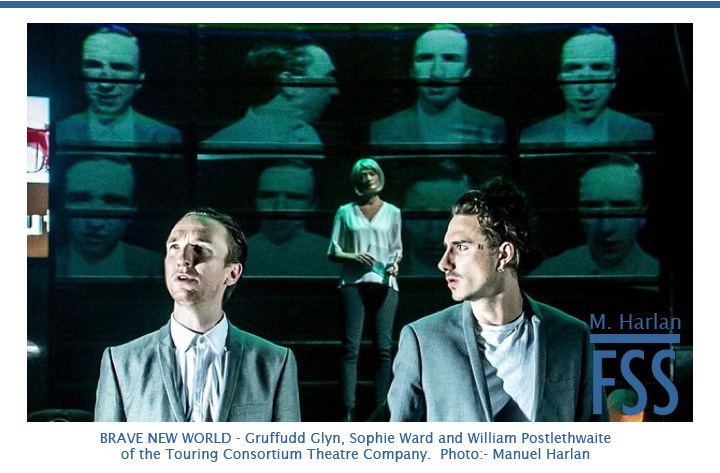 Brave New World is a frightening vision of the future, a ‘negative utopia’ where everything has been designed to provide universal pleasure and gratification, but it comes at a price. The system demands total obedience for giving people the things they desire; they loose their independence and their individuality. They have no control over their destinies. You might wonder what this has to do with the decision by the OMJ to enlarge the classification of the Lizard canary at COM shows (2). Surely that’s what everyone desires? Indeed, but one of the lessons from Huxley’s Brave New World is that we should be wary of what we wish for. There will be consequences, and we may not like them. The 2017 World Show was the last in which the Lizard classification was limited to just three individual classes: gold, silver and blue; and the same for stams. From 2018 each ground colour will have three classes: clear cap, broken cap and non cap; the same will apply to stams, making 18 classes in all. I’m sure many Lizard breeders will feel this change is long overdue. Under the points system, broken capped birds have been at a disadvantage when competing directly against clear caps and non caps. They rarely win, and breeders are reluctant to enter them. At the 2017 World Show, the broken caps accounted for less than 10% of the Lizards, even though they are the most common type of cap. Now that classes are to be provided for them, we can expect the number of entries to rise significantly at future COM shows. Surely that is a good thing? The first is that there will be more medal winners. The easier it is to claim a prize; the less it is valued. Who is the real World Champion if there are 17 others with gold medals? The obvious answer is that there should be a separate prize for Best Lizard in each group, but that would probably be a step too far for COM. Why, every other canary breed would want the same! Jos Gerrits (Yorkshire canary champion) and Jules Etienne deliver their birds to the World Show at Hasselt in 2013. Jules went on to win gold medals in both the gold and silver Lizard classes, and was undisputed World Champion. The second is the likelihood of disputes over the definition of the three types of cap. How many OMJ judges have the knowledge and experience to know when a bird is in the correct class, particularly if it is close to the 10% tolerance allowed for clear caps and non caps. The obvious answer here is to appoint specialist judges, but that is contrary to COM’s official policy that OMJ judges should be generalists with a basic knowledge of all varieties, rather than experts with detailed knowledge of a few (3). It is inevitable that there will be controversial decisions that could have a major bearing on the results. I will return to this topic in Part 2. A silver male Lizard canary, but is it a clear cap or a broken cap? The third is that more classes and more Lizards will mean more work for the judges. I cannot envisage COM allocating more time, or entertaining the cost of a third judge. The inevitable outcome will be that the judging will be rushed and more mistakes will be made. Nobody wants that, so what can be done? Judging at the World Show in Bari, 2014. Source: Kanarioloog. The obvious answer is that the birds could be judged by the comparison method. Two specialist judges can judge over 300 birds in a single morning. They spend more time on the good birds and less on the poor ones; the process of selecting the winners is more direct and less bureaucratic (4). From what I have heard, COM has a different answer: it plans to speed up the judging process by reducing the number of features that need to be judged. This was presented as one of advantages of the new Lizard standard proposed by COM-Portugal, which reduced the number of show features from ten to eight. It may be no coincidence that this proposal coincided with the adoption of the new Lizard classification; a classic case of giving with one hand and taking away with the other? You might think that if COM is going to adopt this policy, it should start with the breeds that have the most features because that is where the biggest savings can be made. There are several varieties that have more items on their score sheets than the Lizard, but they are all frills hailing from five different countries, which probably explains why they haven’t been singled out. The Lizard, on the other hand, is isolated and could be seen as an easy target (5). COM is caught on the horns of a dilemma: it is facing demands to recognise new varieties and expand the number of classes, while at the same time it is under pressure to reduce the time and cost of its shows. Something has to give; the price we have to pay for expanding the Lizard classification could be the ‘dumbing down’ of judging standards. A brave new world or the triumph of quantity over quality? Be careful what you wish for. Clear cap or broken cap? I will provide the answer in a few days, but have a go at answering the question in the meantime. Brave New World by Aldous Huxley (1932). The story is set in London in AD 2540. OMJ = Ordre Mondial des juges-experts; COM = Confédération Ornithologique Mondiale. The proposal to expand the Lizard classification was approved by the OMJ Technical Committee at its meeting in Cervia in September 2016. Within Section E (posture canaries) there are over twenty varieties of smooth-feathered ‘type’ canaries and over ten varieties of frills that have been recognised by COM. Two and a half days are normally allocated for judging over 20,000 birds at the World Show. By comparison, the old National Exhibition of Cage & Aviary Birds could judge over 10,000 birds in a morning by using the comparison method. The Lizard is the sole representative of a patterned canary. It may be joined by the new London Fancy if/when it is recognised by COM. It’s less than 10% so must be clear cap, or am I reading the article wrong? A very interesting assessment of what could be (and what probably is). Still no news on the challenge to the ‘new’ Lizard standard from the January meeting – I have been deafened by the silence on the topic.